A new study using Pop-Up health check stations found a possible link between ‘unhealthy’ shopping centres and the number of cases of suspected or diagnosed high blood pressure recorded for people who volunteered for checks. Researchers from City, University of London set up the one day Pop-Up health check stations in seven shopping centres across England, and invited passers-by to have a test to screen for signs of the eye disease, glaucoma. The testing was led by optometrist, Laura Edwards, from the University. Blood pressure readings were also offered 50 per cent of the time to attract potential volunteers with a more comprehensive and familiar health screening. It is well known that persistent high blood pressure (hypertension) can increase your risk of a number of serious and potentially life-threatening conditions including heart attack, and stroke. The research team classed retail outlets in shopping centres as ‘unhealthy’ if they were either a fast-food takeaway, a bookmaker, a tanning salon or a payday loan business, in line with a Royal Society of Public Health (RSPH) report ranking UK town and city shopping centres based on their ‘unhealthy’ and ‘healthy’ retail outlets. The researchers also produced a basic score of each shopping centre’s ‘unhealthiness’, which was the proportion of ‘unhealthy’ retail outlets open on the day of testing relative to the total number of retail outlets open in the shopping centre. 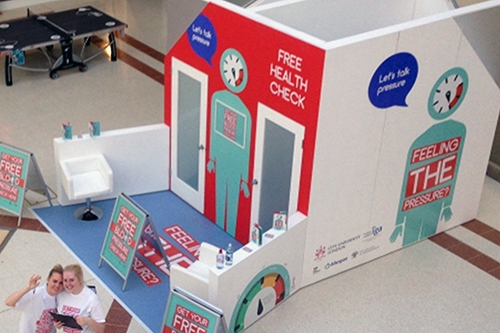 The Pop-Up health check stations were set up in four shopping centres from the top 10 ‘unhealthiest’ shopping centres from the RSPH ranking, and three from the top 15 ‘healthiest’ shopping centres in the ranking. On analysis, the researchers found a link between the number of adult volunteers recorded as having suspected or diagnosed high blood pressure (repeat blood pressure readings at or above 140/90 mmHg) and the ‘unhealthiness’ score they had developed for each shopping centre, which was a statistically significant result. They also found that in the three ‘healthy’ shopping centres sampled from the RSPH report ranking (Bristol, Cambridge and Nottingham), 20 out of 152 adults (13.1%) were flagged as having readings of high blood pressure on repeat testing. In the four ‘unhealthy’ shopping centres sampled (Coventry, Preston, Northampton, Stoke-on-Trent), 45 out of 199 adults (22.6%) had readings of high blood pressure. The difference in the proportion of readings of high blood pressure in ‘healthy’ versus ‘unhealthy’ shopping centres was also a statistically significant result, translating into a 72 per cent increased likelihood of suspected or diagnosed high blood pressure being reported in an ‘unhealthy’ shopping centre relative to a ‘healthy’ shopping centre. The study has its limitations, including Pop-Up health check station assessments not being able to offer a definitive diagnosis of high blood pressure. Based on an RSPH report, the ‘unhealthiness’ score of retail outlets in shopping centres used is a surrogate marker of the ‘healthiness’ of the shopping area, and has not been validated in other studies. The findings may point to strategies for targeted outreach testing and screening of blood pressure in shopping centres that could be the subject of further investigation, potentially in the context of reducing health inequalities. The study is published in the journal BMC Public Health. “Less than half of those adults aged 40-74 offered the free NHS health check take it. The British Heart Foundation also recently called for NHS health staff to take blood pressure checks at gyms, barbershops and football stadiums and offer blood pressure checks in the workplace. We know that more, effective ways of screening people for high blood pressure are needed, and this study offers an insight into some ways that may be done. Our research into UK high streets illustrated how unhealthy businesses concentrate in areas already experiencing lower life expectancy, and this valuable new research explores in detail one of the many factors at play within this alarming trend. The least healthy shopping centres visited by the Pop-Up health check stations are all within some of the most socially deprived areas of the country, so the results of this study exemplify the stark health inequalities that are entrenched across the UK. Exposing and dismantling those health inequalities is a public health priority, and we welcome all promising opportunities for doing so.